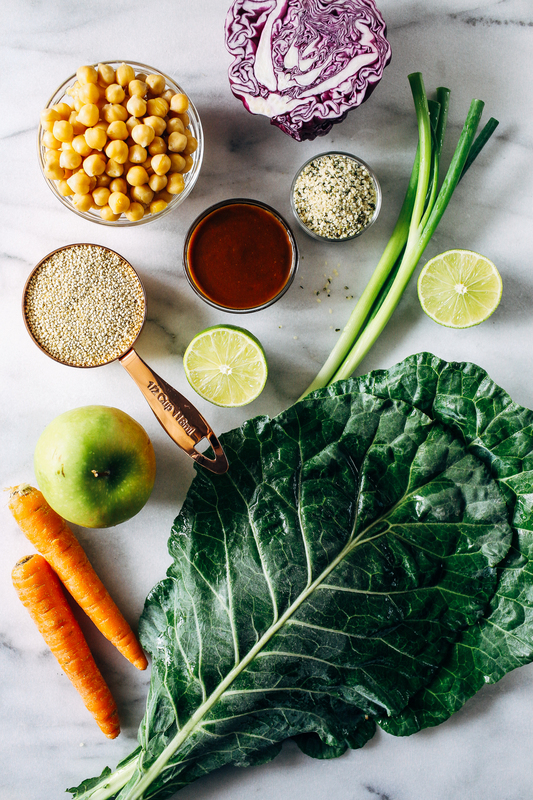 If there’s one thing I think we could all use more of in our diet this year, it’s leafy greens. 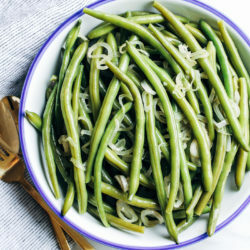 They’re brimming with fiber, vitamins and minerals, and they contain superfood phytonutrients that can help lower your risk for diseases like heart disease, diabetes, and cancer. 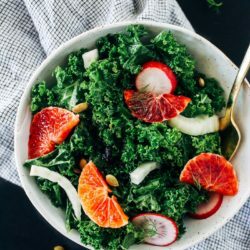 My go-to choice is typically kale because I like that I can prep a huge salad, store it in the refrigerator and it not be soggy for days. Collard greens come in second place although I really don’t eat them as often as I should. I’m hoping that living in the south again will make that easier to do; they’re on pretty much every menu around here. That and pimento cheese. Back to collard greens. 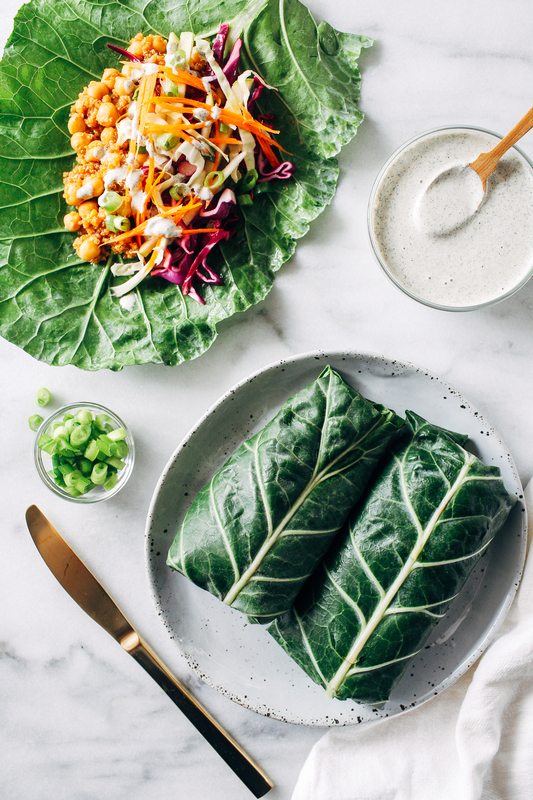 Have you ever tried a collard wrap? The first time I did was several years ago when I made Andrea’s Collard Wraps with Chickpea Walnut Meat. If you like peanut sauce you have got to try those. They are so good and easy to make too! I especially love the way I feel after eating them. Full and satisfied, but not weighed down. So much better than a big ole carb laden sandwich. This version sticks true to the southern roots of collard greens by combining barbecue sauce and ranch dressing. I used store-bought sauce to help save time since washing the wraps and making everything else is enough work. But feel free to make your own sauce if you want. More power to you. Otherwise, if you’re feeling lazy like me, I would recommend sticking with your favorite brand of sauce. 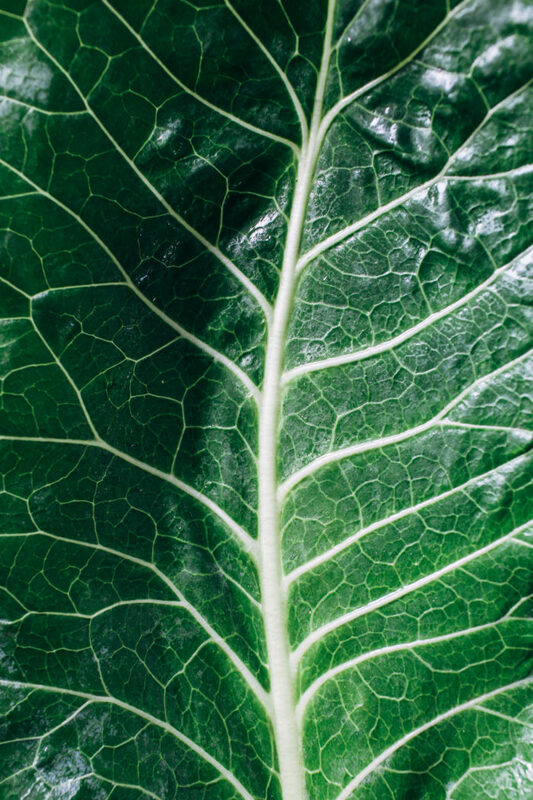 After you’ve washed the collards, you’ll need to slice off the thick stem on the inside. This helps make them easier to roll up like a burrito. For the filling I used a combination of quinoa and chickpeas with barbecue sauce paired with a tangy cabbage slaw made from cabbage, apples and carrots. The ranch dressing (or dipping sauce, if you will) is made from hulled hemp seeds, lemon juice, garlic and dill in a blender. It’s so easy to make and is probably my favorite part of the recipe. It’s definitely going to be my go-to for ranch dressing from here on out. Once you have the filling in the center of the wrap, you fold up the sides then roll it just like you would a burrito. 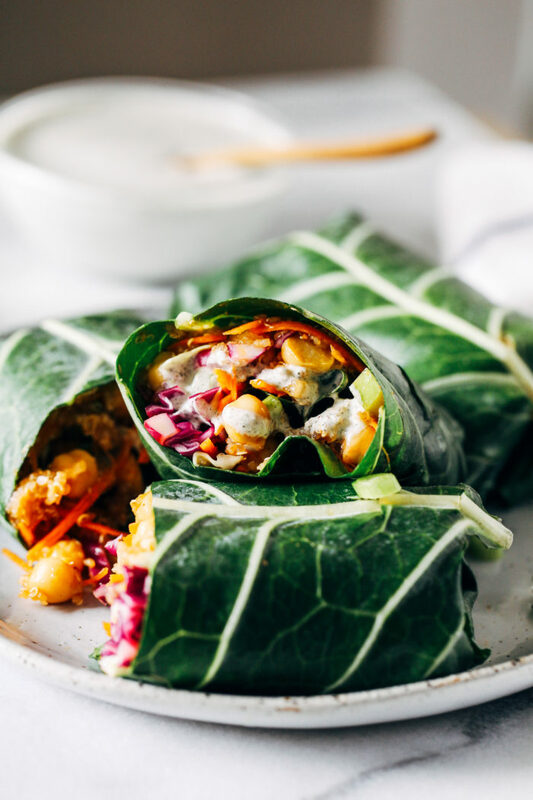 The beauty of these wraps is that they don’t get soggy like bread would so you can prep them ahead for lunches during the week. 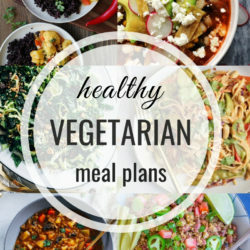 They’re a great way to get in a full serving of leafy greens, protein, and healthy omega fats. I hope you enjoy them! In a large bowl, combine the ingredients for the cabbage slaw. Stir together until evenly coated then set aside. 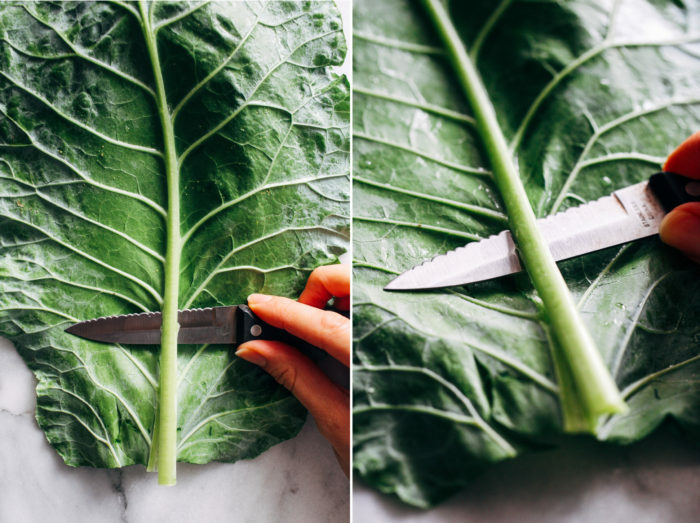 Thoroughly rinse and dry the collard leaves, slice off the bottom stem, then set face down. Using a sharp knife, carefully shave off the thick part of stem on the inside of the wrap. It works best if you slice from the top of the leaf working toward the bottom. This step will make it easier to fold into a wrap. In a small saucepan over medium-low heat (I used the same one that I cooked the quinoa in), combine the chickpeas and the cooked quinoa. Add the barbecue sauce to the saucepan then stir together until evenly coated. Cook for 5 minutes, until heated through. Scoop 1/8th of the chickpea mixture into the center of each collard leaf along with the cabbage slaw. Fold in the top and bottom sides then gently roll like you would a burrito. Serve with hemp ranch dressing and enjoy! *I like to add quinoa for extra protein but you can skip it if you’re short on time. However, please note that it will decrease the serving size to 6 wraps. To make 1 cup cooked quinoa, combine 1/2 cup dry quinoa with 1 cup water and a dash of salt. Bring to a boil over medium-high heat then decrease the heat to a gentle simmer. Cook until the quinoa has absorbed all of the water, about 10 minutes. Remove the pot from heat, cover, and let the quinoa steam for 5 minutes. If not using the quinoa you can also roast the chickpeas on a lined baking sheet in the oven for 10 minutes at 400°F then transfer them to a bowl with 1/4 cup barbecue sauce instead of 1/2 cup. Nutrition Facts are for one collard wrap with hemp ranch dressing. I’m gonna have to try that ranch dressing! I haven’t had ranch in years and this homemade version sounds right up my alley. I must agree about the separate post for the ranch dressing. I can’t have dairy, so this recipe is very intriguing. Can’t have legumes or grains, so the rest of the recipe needs adjusting, but the dressing sounds SO good. These sound phenomenal! Giving up dairy is HARD, I’ve tried to many times, but I just can’t quite kick it! I don’t eat collard greens enough either! 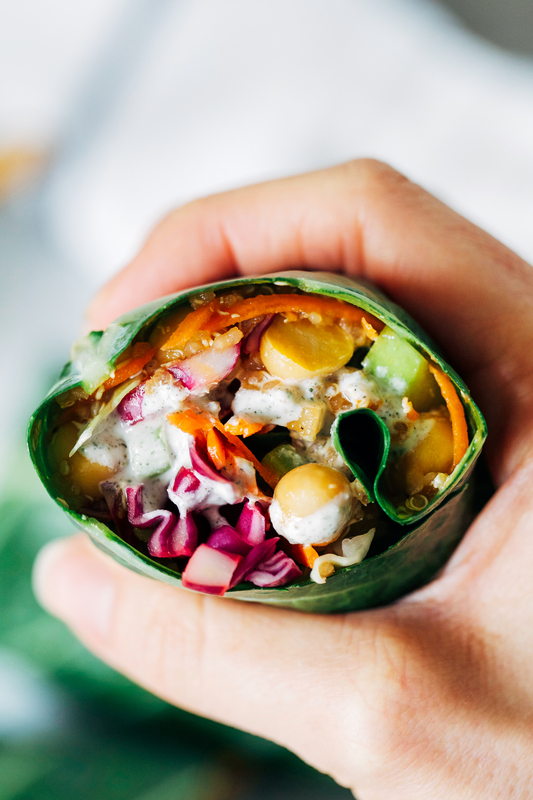 This is a great use for them, and I love that hearty, healthy filling that’s going on in these wraps — with no sogginess in sight! 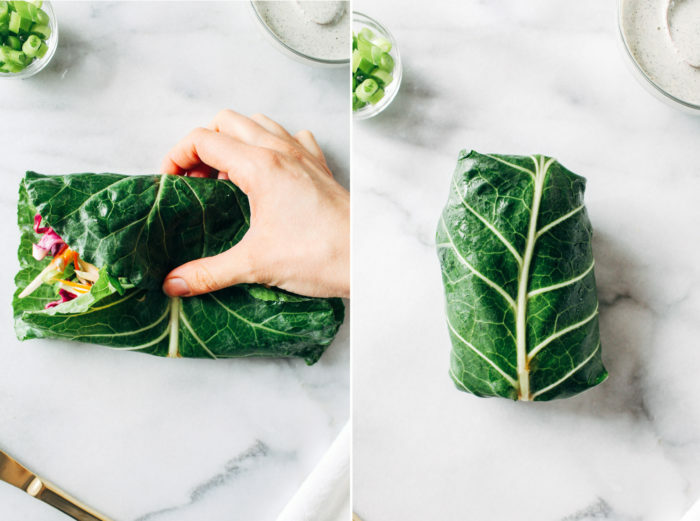 I haven’t had collard wraps in foreverrrrr but you’re right–they’re nice and light, unlike a sandwich tends to be. And the BBQ sauce with ’em? SOLD. What bright, beautiful, healthy wraps! I don’t make green wraps as much as I should at home, but I enjoy it any time I order them out. As you said, I like how they’re light yet satisfying. Ugh I hear ya, vegetarianism was a piece of cake for me, but when I went vegan for a little while there, it was HARD. Dairy is in so many things, especially at restaurants! I only eat a few dairy items, but I love cheese haha. So are you trying to transition to a fully dairy free diet? I really love collard greens but for whatever reason have a hard time finding them at my store! Which blows my mind because um, hello I live in the south! ANYWAY. haha These wraps sound fantastic!! 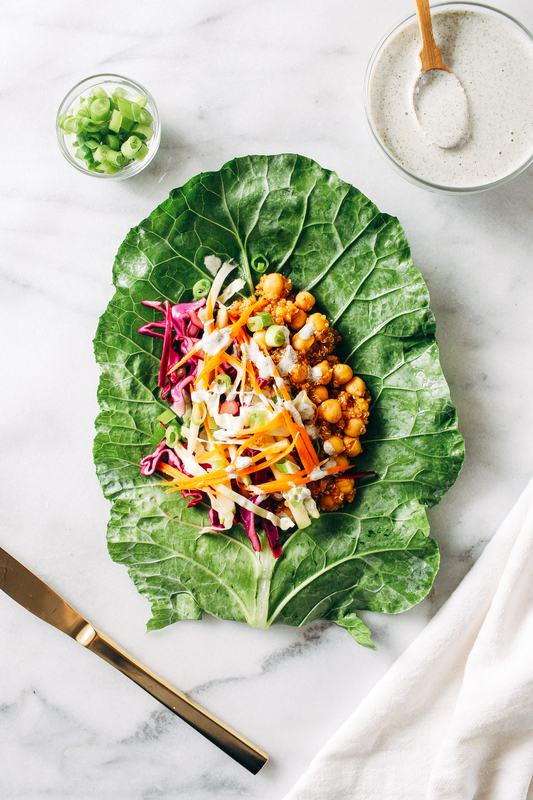 I made this wrap for lunch today (had to tinker with the proportions since I was just making one for myself)–but it was SO delicious! It had all the flavors and textures I needed for a satisfying lunch. Just as you said, I feel full and satiated, but not heavy. Thank you! Yay! So happy you liked them, Jessie. And I’m impressed you were able to portion it down. That’s not easy to do! I love the southern recipes! And good for you, resisting pimiento cheese. If it’s on a menu anywhere, I’m pretty much always ordering it haha. Apparently I’m not a “true” southerner, though, because I don’t like putting vinegar on my greens and I frequently drink unsweetened iced tea! 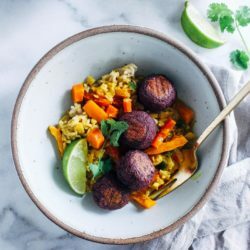 I made these for dinner tonight and they were SO GOOD! A winner recipe, thank you. :) I also subbed in cashews for the hemp seeds and the dressing came out perfectly — in case anyone is wondering. That makes me so happy, Cassy! Also good to know the dressing works with cashews. Thanks for sharing! Wish I could post a photo :) I am new to your blog, but have made your chipotle lentil dish before. 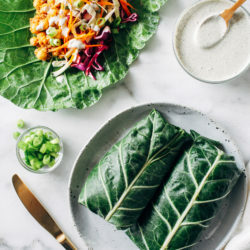 I just tried these collard green wraps- even my husband is eating them and loves that I will be able to make them for him to take to work. He also loves the dip. Unfortunately, he had to have his without the bbq sauce, because he is allergic to cayenne and when I bought the bbq sauce i didnt realize it had this in it until i tasted while cooking and mixing (good thing I did!!) We are in our 40s and a mission to lose weight and become healthy. Second recipe I tried- Loving them! :) By the way, he loved the slaw so much I gave him a huge helping on the side of it with the wraps. Love there is no sugar- since he is a diabetic. These wraps are gorgeous and I am so making this ranch dip ASAP! This was my first time trying a recipe from your site and I’m sold! All meals will come from your site only from now on (maybe a bit of an exaggeration)! I’m in the middle of a 21 day cleanse which involves no sugar, gluten, animal products, caffiene or alcohol. Which has been a bit of a struggle for this ice cream loving, chick-fil-a going, southern girl. 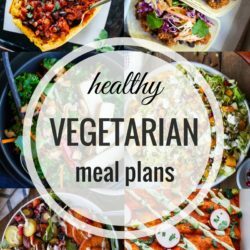 But doing this is lead me to want to cook vegan at home when I am through. I am thankful for your site and your meal plans. Keep them coming. Omg! I just made this and literally devoured on the first bite!!! I used a spicy barbecue sauce and along with the ranch gave an excellent flavor! Thank you for sharing!